Back when I was working as a project lead, everyday my project manager would ask me the same question. He was so punctual about it, even on days when our coffee machine wasn’t working. As you can see, tracking progress is an obsession we all have. At this very moment, if you pay close attention, you can hear mouse clicks of thousands of analysts and managers all over the world making project progress charts. So today, lets talk about best charts to show % progress against a goal. Lets say you are responsible for sales of 100s of products (which belong to handful of categories). You are looking at sales of each product in last month & this month. 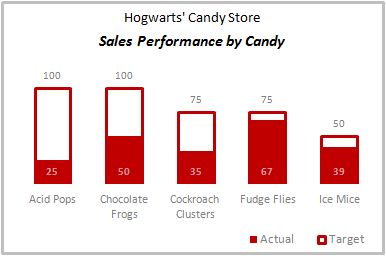 And you want to understand whether sales are improving or declining by category. How would you do it? Turns out, this is not a difficult problem. In fact, this question is asked every day & answered using Advances vs. Declines chart. You may have seen this chart in financial newspapers or websites. 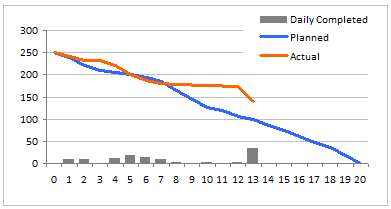 Shown above, Advances vs. Declines chart tells us how many items have advanced & how many have declined. 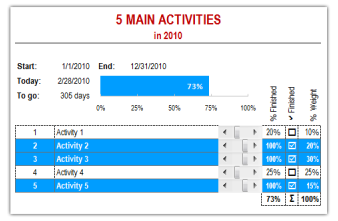 Read on to learn how to create this chart using Excel. How is first set of numbers different from second set? A classic example of this is, lets say you are comparing productivity figures of your company with industry averages. Merely seeing both your series as lines (or columns etc.) is not going to tell you the full story. But if we can shade our productivity line in red or green when it is under or above industry average… now that would be awesome! Something like above. In this 2 part tutorial, we will learn how to design a project portfolio dashboard. Part 1 will focus on user needs & design. Part 2 on Excel implementation. 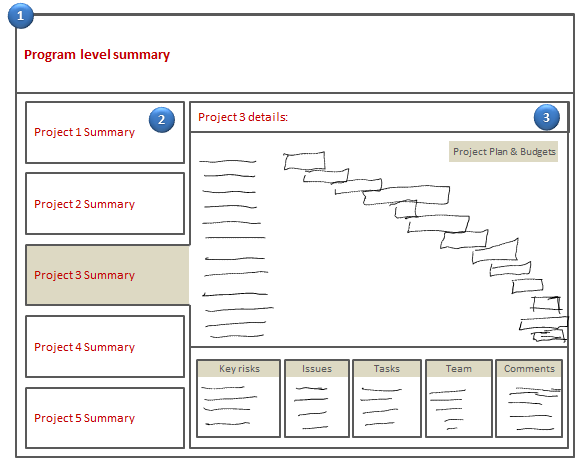 As you may know, we sell a set of Excel Project Management templates. These templates help plan, track, manage & report a project right from Excel. While these templates good, they have one limitation. They work for one project at a time. Many customers have asked me if I come up with a project portfolio dashboard that can tell what is going on in a set of projects in one view. And that is where we begin. Best Charts to Compare Actual Values with Targets – What is your take? Comparing values is one of the main reasons we make charts. Yesterday we have a post on using thermometer charts to quickly compare actual values with targets. Today we follow up the post with 10 charting ideas you can use to compare actual values with targets. 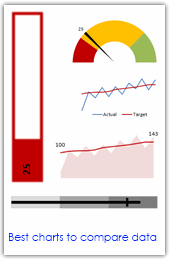 Check out how bullet charts, thermometer charts, traffic lights, gauges, column charts, area charts can help you compare targets with actual performances. A review of best charting options when you need to compare. Read the rest of the post to see the options and participate in poll. Comparing values is one of the reasons why we make charts. So today I am going to teach you a handy little trick to make a thermometer like chart to compare targets with actuals. This type of chart is very useful when you have a bunch of sales targets and you want to measure how the performance has been. 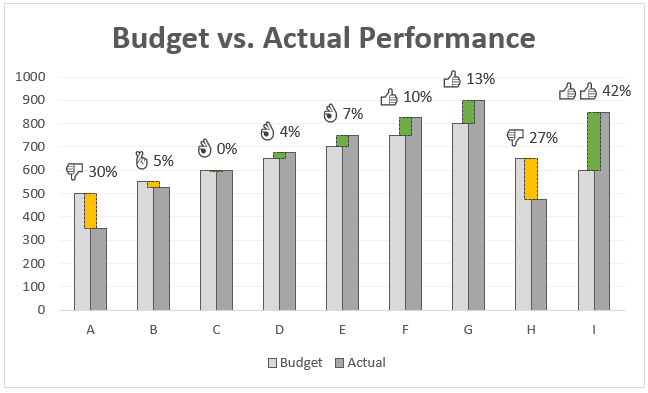 Do you want to make a budget vs. actual performance chart but not sure what option to use? 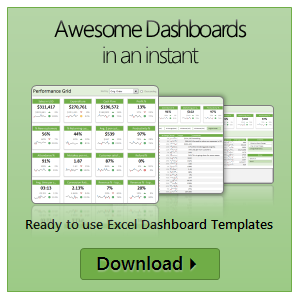 Check out these 14 excel charting alternatives and find the one that tells your story.